Have you ever pulled a muscle while lifting a heavy box or switching to a new gym routine? There are endless ways in which you can overexert your body and end up with sore muscles. You may reach for an ibuprofen pill, but sometimes even painkillers won’t cut it. All they might do is leave you with an upset stomach to add to your misery. If you’ve been there and done that, it’s time to explore some safer and natural ways to beat the pain. One of them is to use a homemade salve for sore muscles. While there are plenty of balms and salves you can buy, they are often laden with petrochemicals and aren’t a very healthy choice. Mother Earth provides us with several herbs and spices that can work just as good as any NSAID (a nonsteroidal anti-inflammatory drug) like ibuprofen or aspirin to give you quick relief from pain and inflammation. Instead of just masking the symptom, these homemade salves provide a holistic healing option for your body. 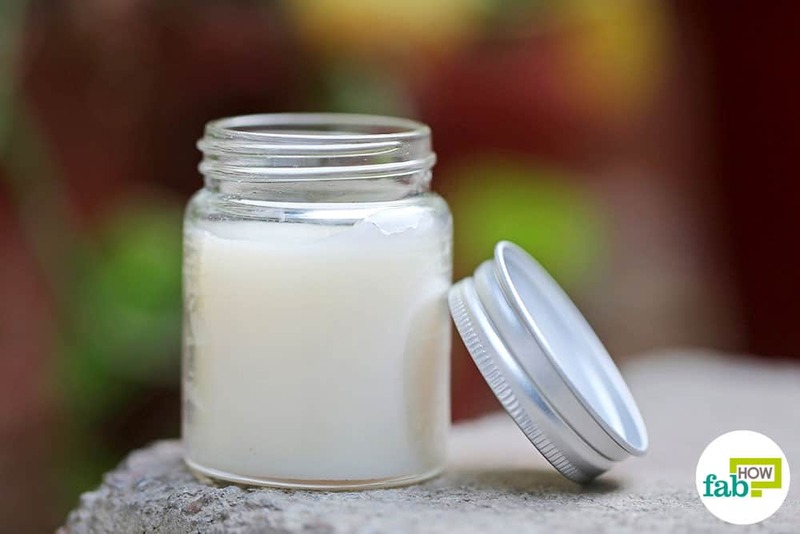 Caution: Since these homemade salves contain strong ingredients, do not use them on children. Also, if a salve irritates your skin too much, wash it off with soap and water. Do not use the salves on broken skin. Here are the top 2 powerful DIY salve recipes for sore muscles and pain relief. This powerful duo can form an excellent homemade salve for sore muscles and joint pain. 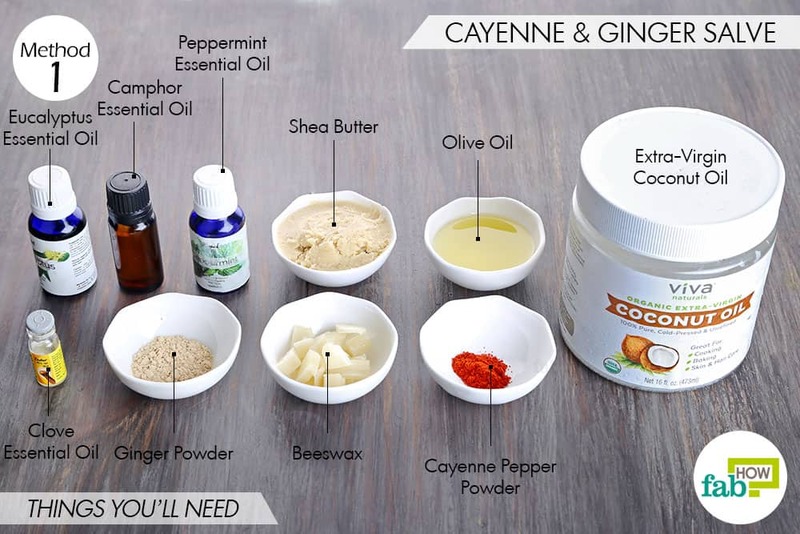 This salve recipe also uses coconut oil, olive oil, and shea butter that moisturize the skin and assists in the absorption of the pain-relieving ingredients into your skin. There is also a blend of essential oils that have numbing and analgesic properties to provide quick relief and get rid of sore muscles. Note: Do not breath cayenne pepper in when mixing. It can irritate the respiratory tract. 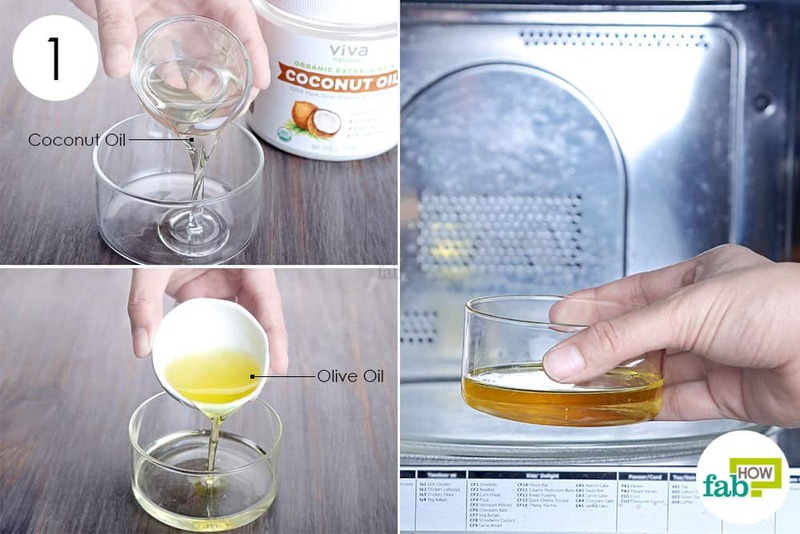 Pour 2 tablespoons of extra-virgin coconut oil into a microwave-safe glass bowl. Microwave the oils on high for 1 to 2 minutes. Add ½ teaspoon of ginger powder to the oil blend. 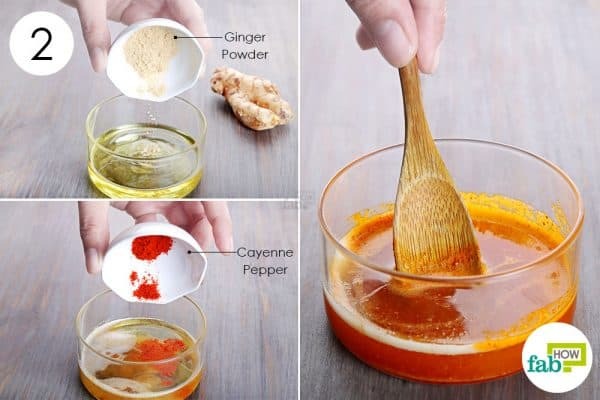 Add ¼ teaspoon of cayenne pepper powder. Mix the ingredients well and set it aside in a warm corner to let the spices infuse into the oils. Assemble a makeshift double boiler. 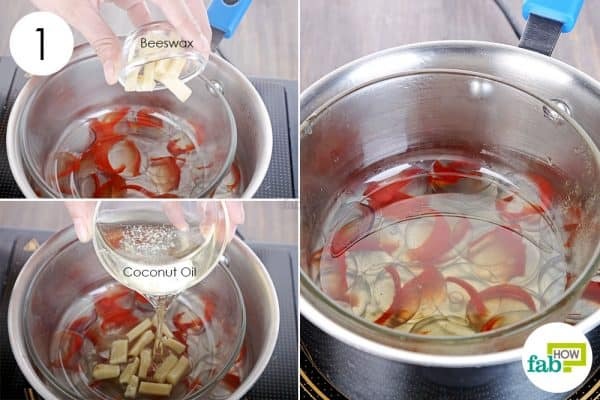 Drop ½ a tablespoon of beeswax into the heat-safe glass bowl. Add 2 tablespoons of shea butter. Let the ingredients melt and blend over medium heat. 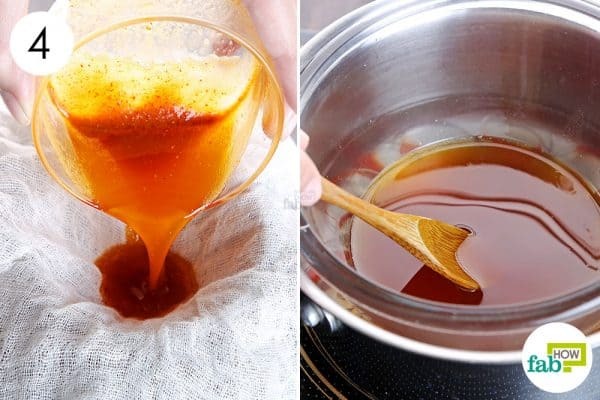 Spread a cheesecloth over a strainer, then strain the oil and spice blend prepared in Steps 1 and 2 into the double boiler. Stir until all the ingredients are blended well. Once done, remove the glass bowl from the heat and set it aside to cool down. 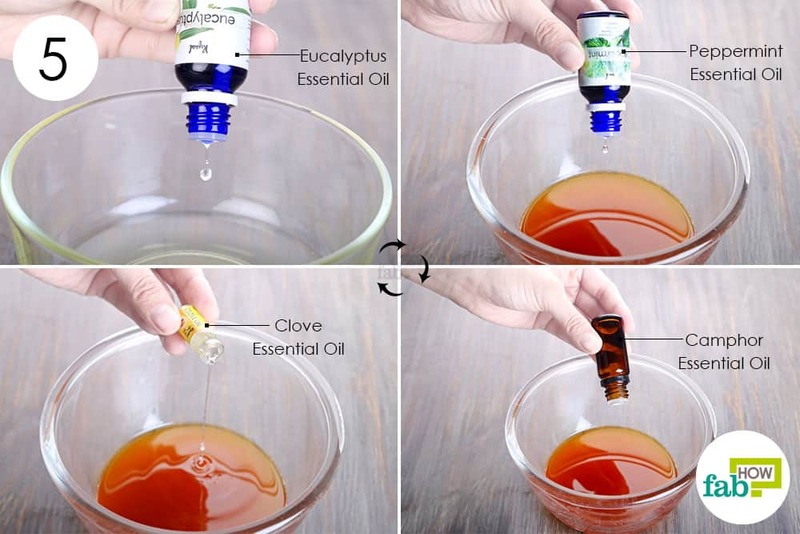 Once the mixture has cooled down a bit, add 4 or 5 drops each of eucalyptus, peppermint, camphor, and clove essential oils. Stir the mixture one more time to blend in the essential oils. Pour the liquid into a small, airtight glass container and put the lid on. 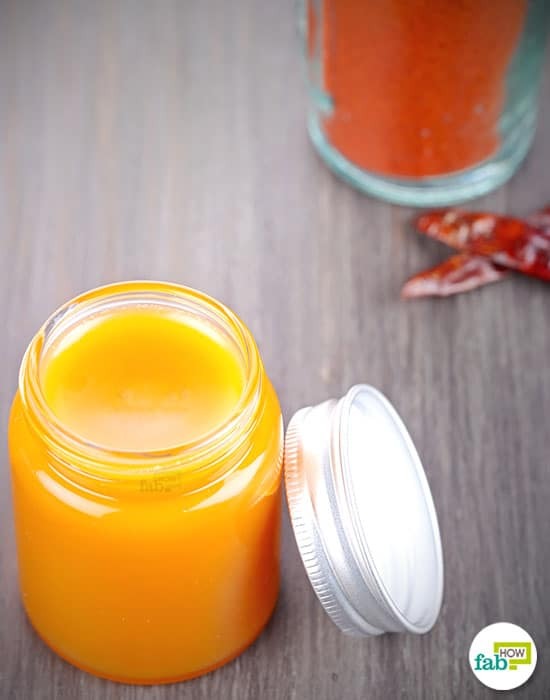 Allow the liquid to solidify completely before using your homemade salve. To use, rub a small quantity of salve between your palms to melt the oils. Apply it to the sore muscles and massage using circular motions to help it absorb into the skin. 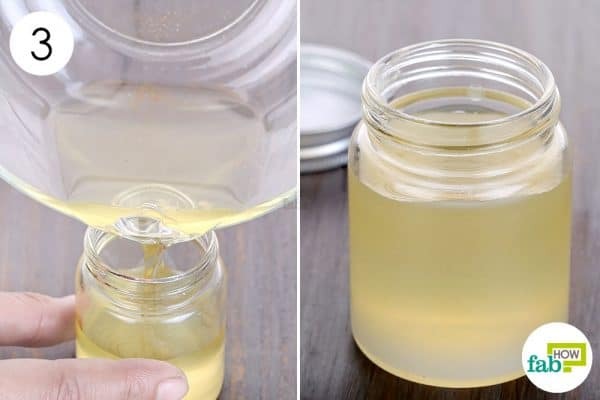 This DIY sore muscle salve will stay fresh for 4 to 5 months stored in a dark and cool place. Essential oils have numerous health benefits. When used in a pain-relieving salve, these therapeutic oils penetrate deep into the tissues bringing down inflammation and pain. Their aroma also helps relieve stress by calming both the mind and body. We have narrowed it down to the best seven essential oils that have superior antispasmodic and analgesic properties. 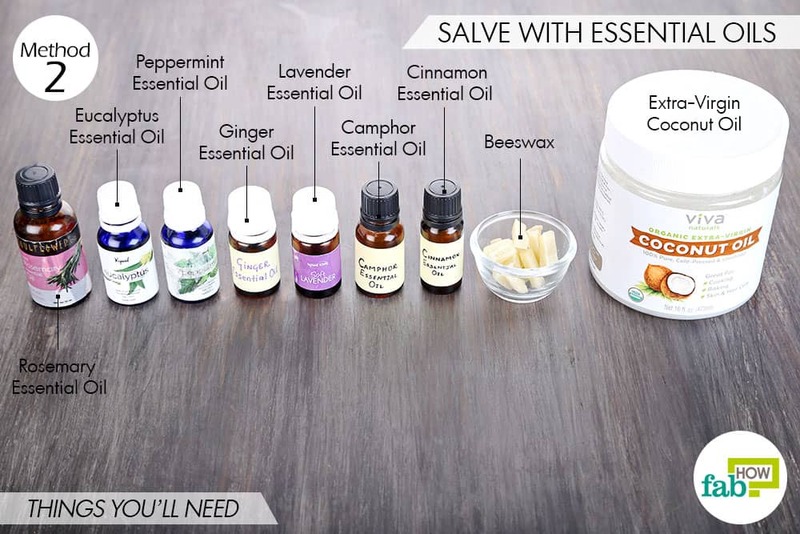 (4) (5) This salve also uses coconut oil that will dilute the essential oils to make them safe for a topical application while ensuring better absorption into the skin. The beeswax in this recipe provides the waxy salve texture, which is why this is one of the top 2 powerful DIY salve recipes for sore muscles and pain relief. 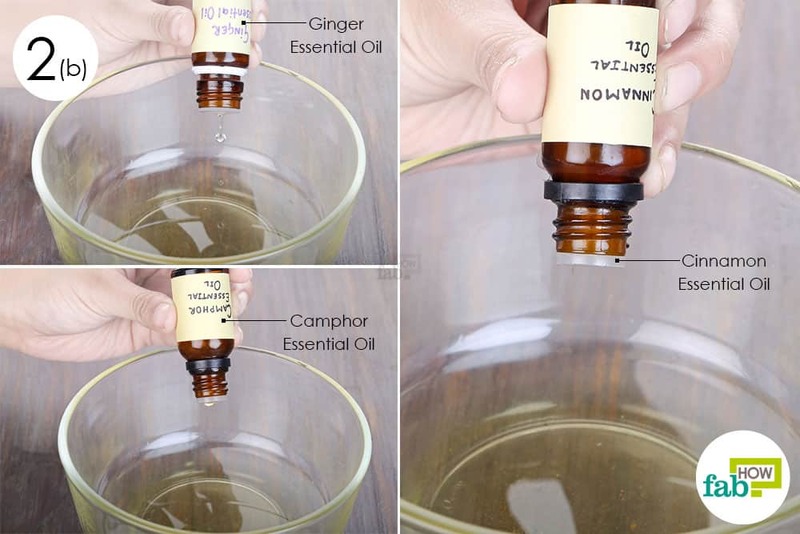 If you don’t have the specified essential oils, you can use dried herbs to infuse the carrier oil. 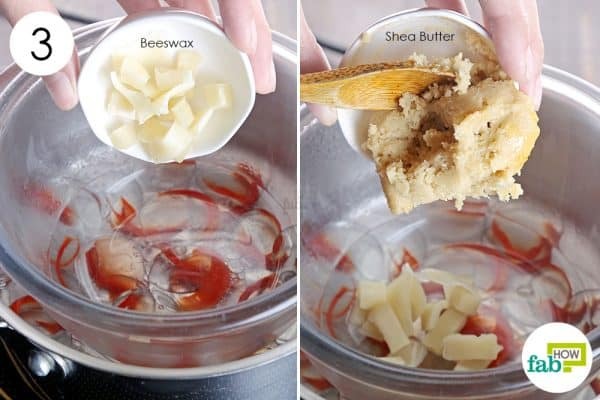 Put ½ a tablespoon of beeswax into the bowl of the double boiler. Add 4 tablespoons of extra-virgin coconut oil. Once done, remove the bowl from the double boiler and let it cool down for 1 to 2 minutes. 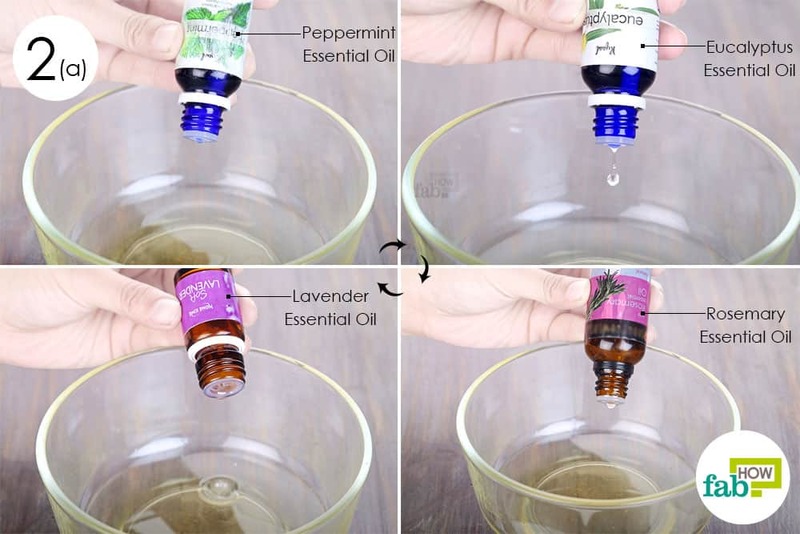 Once the mixture has cooled down a bit, squirt 3 or 4 drops each of eucalyptus, peppermint, rosemary, and lavender essential oils to it. Add 1 or 2 drops of ginger essential oil. Finish by adding 3 or 4 drops each of cinnamon and camphor essential oils. Stir well to thoroughly blend all the ingredients. 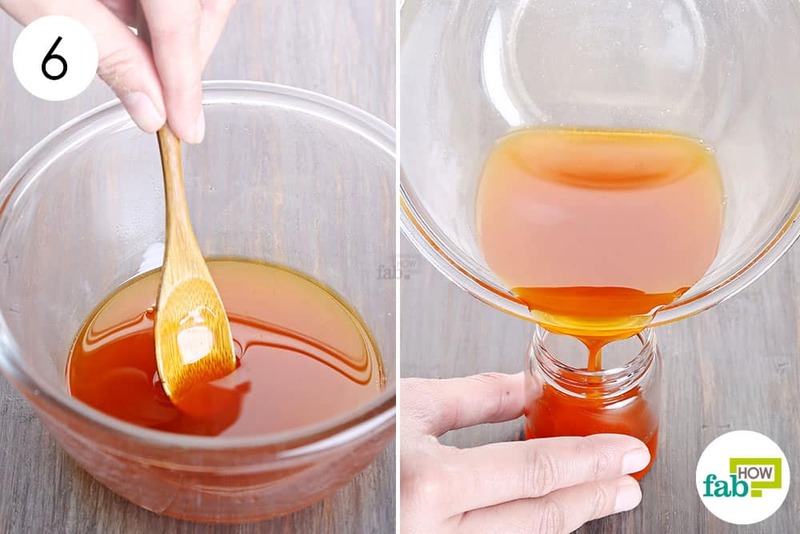 Pour the oil blend into an airtight glass jar, and allow it to solidify completely. Use it like a regular pain-relieving balm to soothe your sore muscles and joints. To prevent sore muscles, do some stretching and warm-up exercises before undertaking any strenuous physical activity. Using a cold compress on sore muscles can help speed up healing. You can learn how to make a cold compress at home here. Be careful not to bring your hands close to your eyes, mouth or nose after touching the salve. The strong essential oils can reach your mucous membranes and cause irritation. Always wash your hands after using the homemade salve for sore muscles. Make sure that you let the heated ingredients cool off a bit before adding the essential oils. Essential oils are highly volatile, and the heat can change their chemical composition. O'Neill J, Brock C, Olesen AE, Andresen T, Nilsson M, Dickenson AH. Unraveling the mystery of capsaicin: a tool to understand and treat pain. Pharmacological Reviews. https://www.ncbi.nlm.nih.gov/pubmed/23023032. Published October 2012. Bode AM. The Amazing and Mighty Ginger. Herbal Medicine: Biomolecular and Clinical Aspects. https://www.ncbi.nlm.nih.gov/books/NBK92775/. Polefka TG, Bianchini RJ, Shapiro S. Interaction of mineral salts with the skin: a literature survey. The Canadian Journal of Chemical Engineering. https://onlinelibrary.wiley.com/doi/full/10.1111/j.1468-2494.2012.00731.x. Published July 10, 2012. Nasiri A, Mahmodi MA, Nobakht Z. Effect of aromatherapy massage with lavender essential oil on pain in patients with osteoarthritis of the knee: A randomized controlled clinical trial. Complementary Therapies in Clinical Practice. https://www.ncbi.nlm.nih.gov/pubmed/27863613. Published November 2016. Lakhan, Shaheen, Sheafer, Heather, Tepper, Deborah. The Effectiveness of Aromatherapy in Reducing Pain: A Systematic Review and Meta-Analysis. Advances in Decision Sciences. https://www.hindawi.com/journals/prt/2016/8158693/. Published December 14, 2016.